Tiffany Pitts is a former molecular biologist of questionable merit living in the Pacific Northwest. In between dog walks and writing books, she blogs quite a bit about pets, parenting and the value of scientific thinking on tiffanypitts.com. Double Blind is the first book in the Thanatos Rising series written by Tiffany Pitts. After Delilah Pelham gives herself a good workout at the gym, her twin brother’s new (and socially awkward) roommate, Dr. Carl Sanderson, hands Delilah a letter, clearly showing that Paul is in over his head and needs help. Although skeptical, Delilah is far from surprised that he has landed himself in yet another jam. At the airport, Carl realizes something is off and quickly books a ticket on the next flight, desperate to keep Delilah safe. Back at Delilah’s apartment, her huge cat (with way too many toes), aptly named Toesy, befriends and reveres Jake while making a discovery which leads to his own unexpected transmutation. As Delilah and Carl become embroiled in a sinister game of cat and mouse in the bid to rescue Paul, little does everybody know that all hell is about to break loose. I very much enjoyed Double Blind in that it had just the right amount of balance in drama, humor and suspense. The chapter headings were eye-catching and quite clever as they clearly painted the location of the chapter contents in advance, much like a scene change in a movie. The main character’s horse-sized cat, Toesy, is a real hoot and I couldn’t help but chuckle at each encounter people had with the not-so-miniature fluff ball, and the hilarious thoughts that danced around inside Toesy’s head. The stories taking place, both in America and in Hong Kong, are shrouded in mystery and excitement, leading to one of the most entertaining books I have ever read. 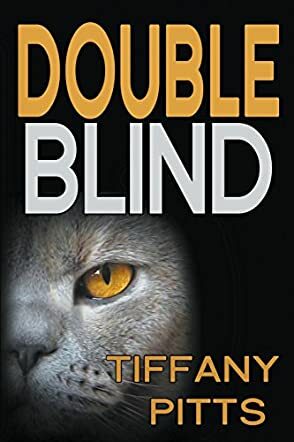 I applaud Tiffany Pitts’ excellent beginning to the Thanatos Rising series and recommend Double Blind to all readers who enjoy their action, adventure and crime fiction served up with a hilarious dose of animal antics.